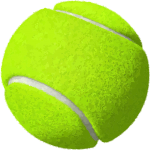 Balls – members are required to provide their own balls (in good playing condition) for Social Tennis and fixed games. Tubes containing 4 balls can be purchased from the Bar at reasonable cost. Coaching – visitors are permitted to play at the club a maximum of 5 times in a year, and after that they need to join the club to continue having coaching. Visitor fees for non-members who are having coaching are: adults (19 & over) £2, and for juniors (8 to 18 inclusive) £1. The supplementary fee is not charged to children under 5. Coaching fees are a matter of agreement between the coach and the pupil. If you are interested in receiving individual or group coaching please speak to the coach who will let you have details. Playing times – every day 9.00 am – 10.00 pm by when floodlights must be extinguished. Category A members: Thursday evenings and Sunday mornings are the most popular times – these can be busy sessions and all courts may be used with the exception of 1 court for juniors (if they require it) and coaching on court 4 on Thursday evening up to 7.00pm. Category F: Monday evenings from 7pm. Category B (but also open to Category A & F members): Tuesday mornings from 9.00am on four courts (coffee and biscuits usually supplied by those participating in the session). Junior and Mini Tennis priority club night – Tuesday afternoons from 4.00pm. Please ask the Head Coach for details of group coaching sessions appropriate to age and ability and coaching fees. In addition to group coaching unsupervised mix-in play is available to responsible Juniors (aged 8 and over) on all other courts on Tuesdays not used for coaching. On all days at least one court (currently court 1) is available for junior play at all times. Adults playing on Court 1 should vacate the court at the end of the game (not set) if a junior member indicates they require the court for a game. There are additional junior coaching clinics on Saturday morning and both Monday and Friday from 4pm. Fixed games – outside the times allocated for Social Tennis members are free to make up their own games on available courts. Doubles take precedence to singles. Single play in progress ends at the close of the game currently in progress if a ‘four’ is waiting to play and no other court is available. Court bookings – for evening sessions on a Tuesday, Wednesday and Friday, and the Saturday morning, certain courts are bookable. Sessions may be booked no more than 7 days in advance. More detailed information is displayed in the booking diary to be found in the telephone lobby. Matches – Middlesex League Matches require three courts on selected Monday, Wednesday and Friday evenings from May to the beginning of August and Winter League Matches two courts on the same evenings from September to March Junior matches and the occasional Vets, and Cup matches are mainly played on either Saturday or Sunday afternoons. The bar is usually open during adult league and cup matches and spectators are welcome. Team selection and entry to the Club Championships is only available to Club members whether Adult or Played Up Junior. Social Events – social events are held throughout the year and details are displayed in the clubhouse. The bar is usually open Monday to Friday evenings, and on a Sunday lunchtime. Members are allowed to hire the premises for s small charge if the request is approved by the General Committee. Open Tournament – the Club’s ‘Open Tournament’ takes place over the second weekend in July when all courts are required for the tournament.